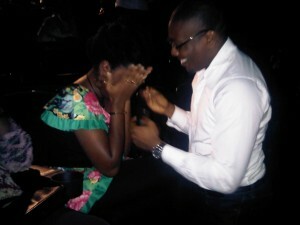 Yoanna Pepper Okwesa Gets Marriage Proposal From Fiancee Inside Silverbird Galleria! In a dramatic and romantic style, FAB Magazine’s Style Editor, Yoanna Pepper Okwesa got a marriage proposal from her fiancée at the cinema hall of Silverbird Galleria yesterday evening. According to an eyewitness’, movie goers were settling in to watch the new Hollywood action flick starring Harrison Ford and Daniel Craig, ‘Cowboys and Aliens’ but got a romantic teaser first. Naeto C Weds Today….First Wedding Photos.